Orca Confirms Gold Discovery at Mor | Orca Gold Inc.
VANCOUVER, BRITISH COLUMBIA--(Marketwired - Jan. 31, 2018) - Orca Gold Inc. (TSX VENTURE:ORG) ("Orca" or the "Company") is pleased to announce that it has confirmed the discovery of a significant mineralised system at its Morondo gold exploration permit in Côte d'Ivoire (Figure 1). Mineralisation at Morondo was first discovered by Red Back Mining in 2010 with intercepts of up to 66m at 1.53g/t gold from a programme of shallow, reverse circulation ("RC") drilling (<60m vertical). Results in Table 1 below. A mineralised target over 600m in strike length was defined with a true width of up to 150m. In December 2017, following the receipt of Ministerial approval for the acquisition of a portfolio of exploration permits and applications from Kinross Gold Corporation, Orca completed a short programme of 13 RC holes for 2,211m, testing the mineralisation at Morondo to a vertical depth of 170m. 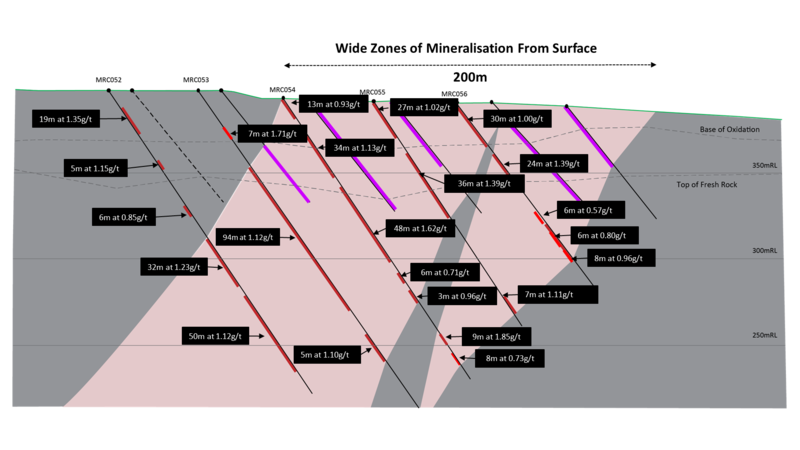 All holes successfully intersected the mineralisation (see Table 2 and Figure 2) over significant widths and up to a maximum of 170m from surface. The zone dips approximately 50° to the north west and is hosted in altered mafic volcanics containing disseminated pyrite. In 2014, three samples of RC chips taken from fresh rock from the previous programme and containing disseminated sulphides, were submitted for leach test work at the SGS Metallurgical Laboratory in the United Kingdom. These samples returned an average recovery of 96% with moderate to low cyanide and lime consumption. Based upon the success of our recent drilling, the next programme will include core drilling to confirm geology and provide further samples for metallurgical test work, RC drilling to expand the discovery and further surface exploration on this highly prospective permit. 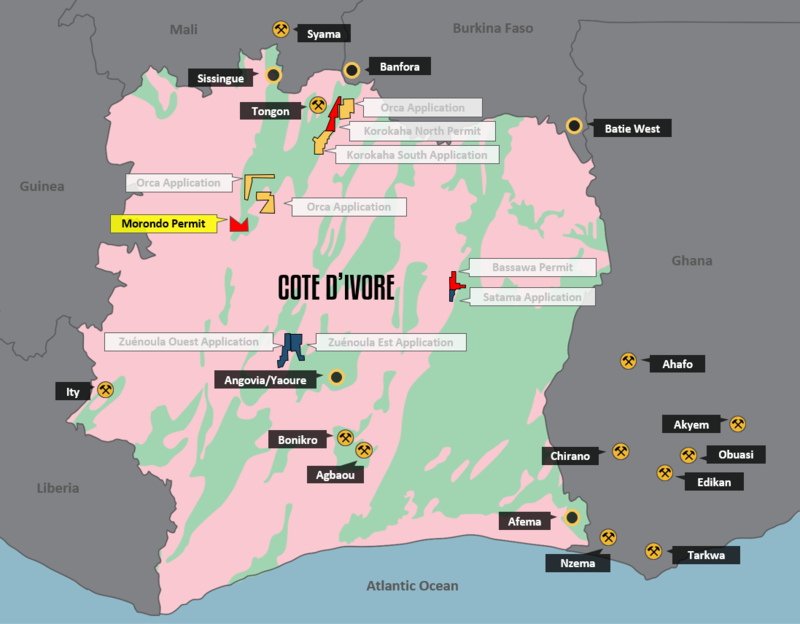 Commenting on this first programme, Hugh Stuart, President and Director of Orca, said, "I have been waiting to get back on the ground at Morondo for a long time and it is great to be exploring in Côte d'Ivoire again. Our recent drilling programme clearly confirms the resource potential at Morondo first identified by the Red Back exploration team in 2009 - the wait has paid off! Given the significant widths and shallow dip (50°) of the mineralisation combined with the excellent leach characteristics shown by early metallurgical test work, we see Morondo having the potential to be a large, low strip, bulk mineable project. Our intention is to fast track an economic analysis of this discovery starting with confirmation and expansion of the metallurgical work. We are also active on the other properties within Orca's extensive portfolio and look forward to reporting on the results from this exciting land package." The technical contents of this release have been approved by Hugh Stuart, BSc, MSc, a Qualified Person pursuant to National Instrument 43-101. Mr. Stuart is the President of the Company and a Chartered Geologist and Fellow of the Geological Society of London. Samples used for the results described herein are prepared and analyzed by fire assay using a 50 gram charge at the Bureau Veritas facility in Abidjan, Côte d'Ivoire in compliance with industry standards. Field duplicate samples are taken and blanks and standards are added to every batch submitted.